Framed raised beds and a modular approach to growing vegetables means more production in less space and with less work. Whether you live in a small city apartment or on a large country estate, you’ll find something in this book to help with your specific gardening challenges. Nones shows you how to set everything up and then gives you in-depth descriptions of all the procedures needed to achieve gardening success: sowing seeds, thinning, transplanting, cultivating, mulching, watering, harvesting, pest control, composting, crop rotation, and seed saving. 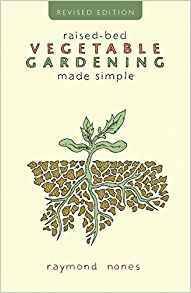 It's a complete gardening guide for both the beginner and the experienced gardener, useful for those who have never tried raised beds before as well as for those who have already tried a raised-bed system. Far less bending, far less weeding, more produce at harvest time, gardeners, what have you been waiting for? Raymond Nones is a dirt-under-the-fingernails organic practitioner and proud penny-pincher who lives and gardens in Queens, New York.